To kick off the 2014 International Year of Family Farming, the European Commission (EC) recently organized a conference in Brussels. 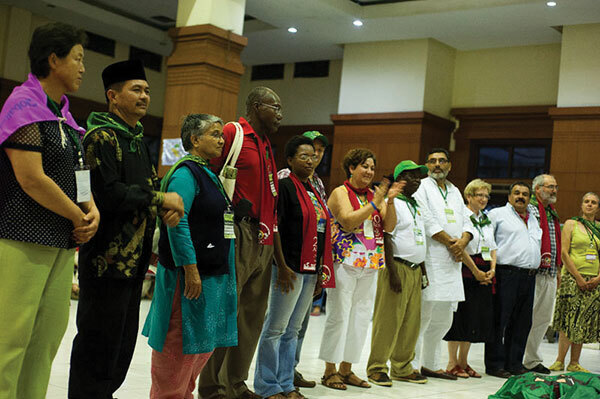 La Via Campesina (LVC) sent male and female farmer leaders from India, Mozambique, Nicaragua, Argentina, United States, Mali, Morocco, Italy, France, Croatia, Romania, Spain and Norway. LVC leaders defended our vision of a peasant- based family farming model and highlighted its vital importance to the European and global economy, as well as its crucial social and environmental benefits. LVC’s vision of family farming is based on agro-ecological principles and labor intensiveness — not capital. Our family farms are able to adapt to the infinite diversity of natural, social and economic conditions. Peasant-based, agro-ecological, small-scale family farms guarantee security and diversity of food for the majority of people across the globe. They are living examples of social, economic and ecological sustainability. Our model of agriculture provides chemical-free food for local consumption, not for export — to support life, not speculation. LVC’s farmer leaders, with their African, Asian, Latin American and European faces, spoke out and showed courage, humility and steadfast commitment to family farming and peasant life. We encouraged re-localization of agricultural products and markets and presented model policies, based on the principles of food sovereignty, that can support, maintain and increase economic and social sustainability within the peasant-based agriculture model. The European government representatives present did not expect the applause that followed every time an LVC peasant leader spoke from the floor. They witnessed the clear voice of the peasant “speaking truth to power” and giving hope through the vision of a better future for agriculture and food for all. European government representatives gave us the old “fairytale” stories of the vast potential for public-private partnerships between large industrial-scale agribusiness corporations and small-scale family farmers in order to feed the world, and they spoke of a supposed “free market” where we can all compete on a level playing field. Let’s look at some facts. With access to only 20–25% of the world’s arable land, small-scale family farmers across the globe feed 70% of the world’s people, while, according to the UN Food and Agriculture Organization (FAO), more than 40% of the products that enter the agro-industrial food chain is lost to decomposition. The corporate giants, who promote biotech “quick fixes” and chemically dependent agriculture, join with financial and investment firms to play with the markets, which impacts our access to food. They have now joined together to create an epidemic of speculative land grabbing, further restricting peasants’ access to land. These corporations are spending millions of dollars worldwide to lobby and pressure international institutions and national governments to pass agricultural laws and “free trade agreements” that create conditions favorable only to them. In the process, they actively undermine the rights of both peasants and consumers. Family farmers will continue fighting to feed the world, while supporting life and freedom.